A Mad Max Replica Coupe is currently being offered for sale on the Unique Cars website. We started with a November 1973 built XB V8 GS Fairmont coupe built one month before the original Mad Max movie car. It is now running a 351 Cleveland, 4 speed top loader and 9″. It is factory black trim and long range fuel tank. As the car was a factory GS Fairmont coupe it already had the main GT items such as the trim & dash that the Mad Max car had. The car was then stripped and repainted. All the Mad Max parts such as the siren, police radio, spoilers, supercharger, rims etc were supplied by Mad Max builder and expert Gordon Hayes. The engine was built by Wally White to GT spec. This Mad Max Replica Coupe has featured in Australian Muscle Car magazine and Street Machine magazine. 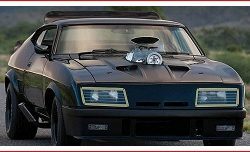 Click Here to visit the Unique Cars website for more details about the Mad Max Replica Coupe currently advertised for sale.